If you have lost your iPhone or you’re planning to sell or give it away, it’s always advisable to permanently delete all the sensitive date saved on the device. This shields the data from unauthorized access. Would you like to erase iPhone from iCloud? Are you wondering this right now? Well, we have a solution for that. In this article, you’re going to learn two top methods of erasing all content and settings on your iPhone from iCloud. The methods have been outlined in clear step-by-step guides to make it easy for you to comprehend. All the contents and settings will be removed from the iPhone. Your iPhone will be reset to factory default. 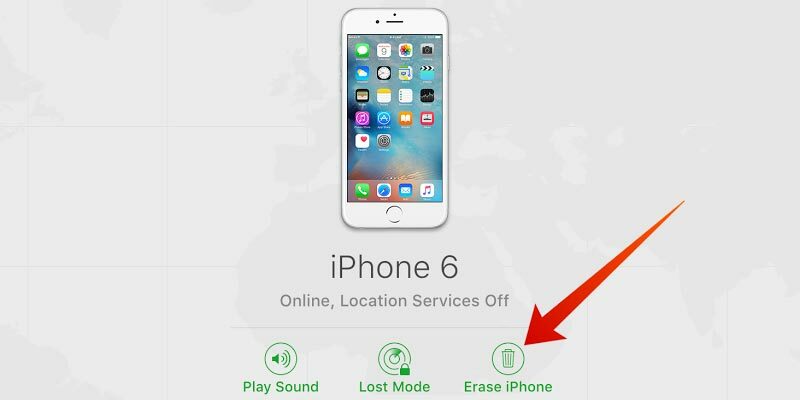 The “Find My iPhone” will be disabled from the iPhone. The iCloud account will be removed from iPhone, so the later owner can sign in his own iCloud account. You cannot use iCloud to trace your iPhone again. If you lost your iPhone and the “Find My iPhone” is enabled on it, you can trace the lost iPhone via iCloud. If your iPhone don’t have the screen lock and you are concerned about your private data will be leaked, you can remotely erase your iPhone from iCloud. However, if your lost iPhone has the screen lock, anyone who gets it won’t access your iPhone data. If he restore your iPhone, he still cannot get into the iPhone normally as the iPhone is locked to your iCloud account.That means this lost iPhone is useless for anyone who gets it. On your iPhone, go to “Settings > General > Reset > Erase All Content and Settings”. Type your iCloud password as required. Then all the data and settings will be removed from iPhone and your iPhone will be erased from your iCloud account. It’s available only when you have “Find My iPhone” enabled. Go to iCloud.com and log in with your iCloud account. Tap “Find iPhone” and type your password again if it requires. It will show you the location of your iPhone. Click on “All Devices” tab and select the device you want to erase from iCloud. An information Window of the device you’ve selected appears. 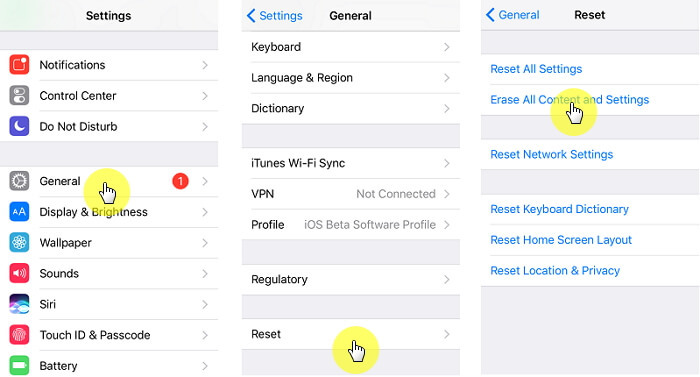 Simply click “Erase iPhone” to reset your iPhone and remove your iPhone from iCloud. Confirm by tapping Erase and enter your iCloud password to initiate the process. It’s important to note that the erasing process can start instantly or later. This is dependent on whether the device is online or offline. If the device is online, remote erasing begins and you’ll receive a confirmation email on your Apple ID email address. If your device is offline, remote erasing will starts the next time it is online. You should note that erase iPhone from settings or iCloud is not safe enough as all your iPhone is just locked instead of actually erasing. That means when the hacker find the key technically, your data will be stolen, including your financial info. The safest way to protect iPhone from privacy leak is to completely overwrite all the data on iPhone, especially when you plan to sll iPhone. To safely erase your iPhone before giving your iPhone away, it’s suggested to use iMyFone iPhone Data Eraser Win/Mac by lots of professional software review sites, like . 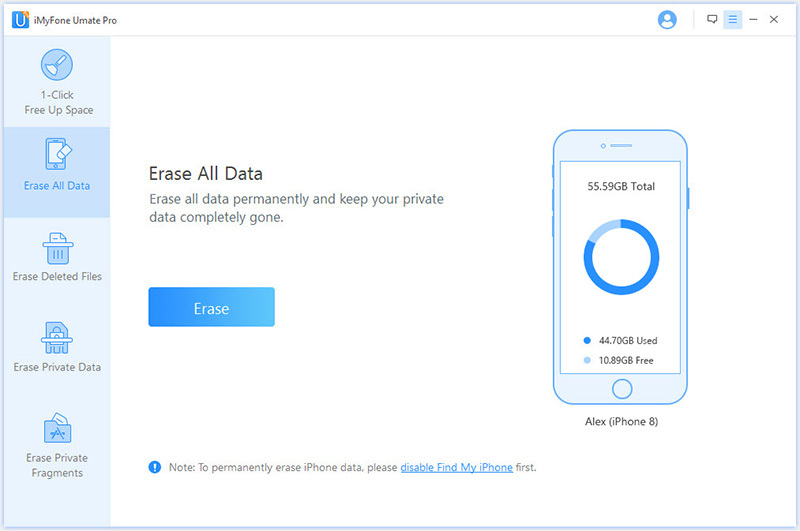 Its “Erase All Data” mode can erase everything from iPhone to be 100% unrecoverable and erase iPhone from iCloud, which is much safer concerning to privacy. Step 1: Run iMyFone Umate Pro on your PC or Mac and connect your iPhone. Step 2: On the program, tap “Erase All Data” from the left sidebar. Tap “Erase” button. Step 3: Type “delete” into the box to confirm and tap “Erase Now” to continue. When it’s done, all the data is safely overwritten from iPhone and your iPhone is erased completely from iCloud. 100% Unrecoverable: All the data erased is no longer accessible and recoverable by any recovery or organization, including FBI! Preview and Select: You can selectively erase some specific data from iPhone, so you can preview and select data to erase. Existing and Deleted Files: You can permanently erase existing messages, call history, notes, etc, and as well as the files you deleted before. You can view the deleted files. Erase 3rd-Party App: It’s the most advanced eraser that supports to selectively erase data from 3rd-party apps, like WhatsApp, Viber, Kik, WeChat, etc.